There is a broad range of plants suitable for use in rain and bioretention gardens within the Omaha region. Simply defined, a rain garden is a shallow depression with a variety of plants that collects runoff, maximizes infiltration, and conveys excess water slowly to the nearest outlet. Similarly, a bioretention garden is a shallow, man-made depression of nearly any size that uses amended soils and an underdrain system to collect stormwater runoff and conveys it slowly to the nearest outflow or channel. With both garden types, water collected in the garden will drain out within 24 hours. In other words they are not ponds, wetlands, or mosquito breeding grounds, they are rain and bioretention gardens. These gardens add beauty and function regardless of location — whether it be a park or parking lot. It is the management of water, soil and plants that gives us a beautiful amenity and proven method for controlling stormwater flow where it’s needed most. This site provides guidance for selecting and designing with plants in the landscape. 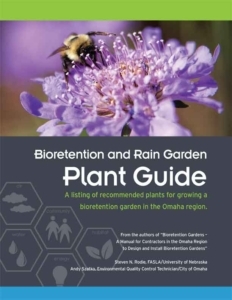 If you would like more information about the design of rain and bioretention gardens, please visit OmahaStormwater.org for more information, including the full manuals for Sustainable Landscapes and Bioretention Gardens. Nebraska and regionally native plants comprise the bulk of the plant list due to the inherent benefits associated with their use. Plants that are native to the local environment greatly improve overall plant success, and as a result, improve project success. Adapted non-invasive, non-native plants that have proven themselves in regional green infrastructure projects are included to broaden plant diversity and availability. Plants with these first two points are referred to as Native or Ecologically Well-Adapted Non-Invasive Plants (NEWANIP) in the City of Omaha’s Environmental Element. Cultivars and hybrids with specific ornamental characteristics, growth habits, and disease or drought resistances are commonly available for many plant species on the list. Selecting and breeding plants for specific characteristics may lessen genetic diversity, but attributes such as compact habit or disease resistance may be worth considering when expectations for garden aesthetics must be met. Do not assume similar growth habits between different cultivars or hybrids, as they can vary significantly. Consideration for the plant’s tolerance for water inundation in the garden is critical and needs to be noted during the design stage. A plant’s preference for location within a rain and bioretention garden is noted for each plant. Shrub use should be carefully considered to ensure they blend in well with the function and look of the garden. Where space allows, they should be used to complement forbs and grass masses, frame and provide backdrops for gardens, and provide food and cover for wildlife. Garden locations beyond the top of berms do not require plants adapted to inundation so other well-suited landscape plants may be considered for selection. Always remember to consider soil conditions and maintenance requirements of the project when making planting choices. 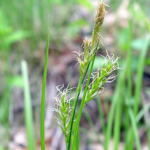 This site includes herbaceous plants, grasses, sedges, rushes, shrubs and trees. Designers should consider all plant attributes and be sure to choose the right plant for the right location in the garden. Doing so will enhance seasonal interest and garden structure. Plants listed in this guide are generally available regionally. Less commonly known species should still be attainable through well-known physical and online sources. Many native plants are becoming more readily available due to increased interest and demand. The plant list found on this site is a starting point for creative selection and use of plants for green infrastructure projects. For future reference, visit OmahaStormwater.org or water.unl.edu/stormwater for supplemental information to this list. Use feet for shrubs and trees to get best results. For those interested in sustainable landscapes, many of the listings on this site work well in bioretention gardens and rain gardens, which filter stormwater runoff and provide the necessary moisture for the plant life within them to thrive. Other listings are recommended by the City of Omaha Planning Department for specific use in commercial landscaping settings. Check back often for new listings. Happy planting!